The ThinkStation P300 entry-level workstation boasts an intuitive purposeful design that delivers unprecedented flexibility. The redesigned chassis no longer features a bulky handle, but rather intuitive red touch points and extended lip in the front and the back for easy carrying and deployment. Additionally, the new FLEX module gives users the option to add only the components they need, allowing customized productivity-boosting configurations with added cost savings for vertical workflows. The FLEX module supports a combination of an ultra-slim optical drive, 29-in-1 media card reader, IEEE 1394 FireWire, and eSATA. Lenovo P300 is equipped with a fast processor and ECC memory support for improved productivity and reliability. Tower workstations provide the ultimate performance with full-featured scalability, yet are small-sized. No more bulky handles, just a clean-looking, functional design. An extended lip on the top lid that includes a red touch point, combined with a ledge on the back-side, make the P300 exceptionally easy to lift and carry. Maximize productivity with independent display support for multiple independent monitors. 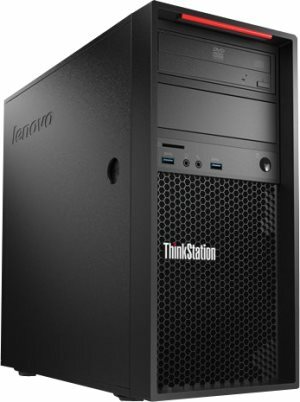 ThinkStation P300 tower is GREENGUARD® certified and features a fixed power supply unit (PSU) that's energy-saving and efficient. With several USB 3.0 ports, plus USB 2.0, you can move data quickly between your workstation and other devices. SuperSpeed USB 3.0 enables file transfer faster than previous USB technologies, which allows for lightning-fast copying of large media files, as well as seamless connections between audio- and video-related devices. ThinkStation P300 workstations include some of the security tools available in the industry, such as USB ports disablement to help prevent data theft and network security risks against unauthorized use of storage devices. The Trusted Platform Module (TPM) encrypts data and key information like passwords and digital certificates, further securing applications, electronic transactions, and online communication.